Sarah Boyle, Centre for Cancer Biology, Adelaide, South Australia. Sarah Boyle, winner of the ‘Research in progress’ photo competition 2017. Breast cancer is the most widely diagnosed cancer in women world-wide, and despite advances in treatment, still remains a major cause of cancer-related death. 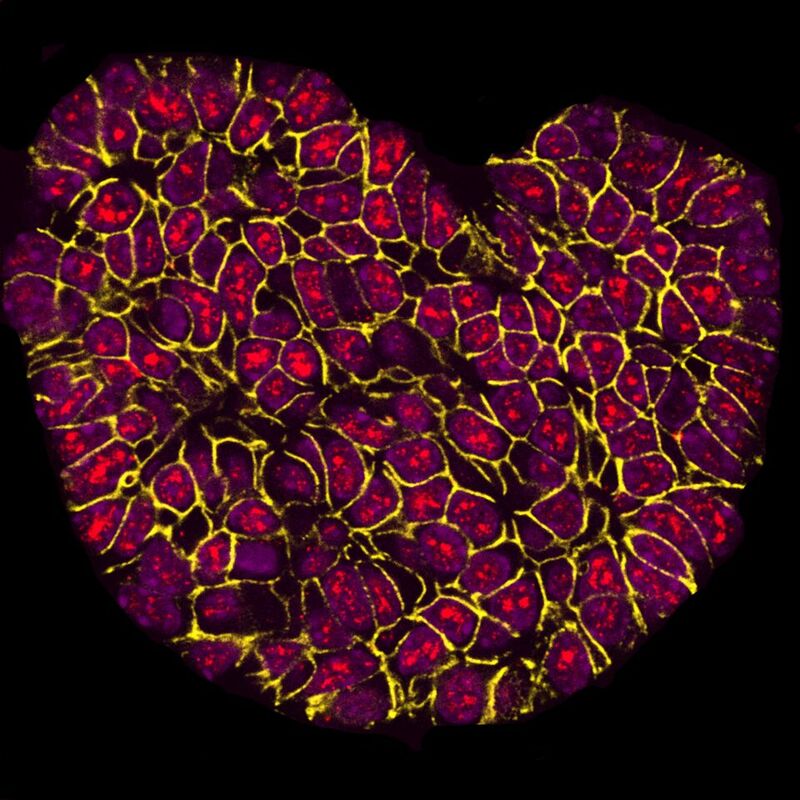 My winning image, “I Heart Research”, was of a fluorescent mouse mammary tumor, captured during my studies into breast cancer progression. This mouse was genetically engineered to develop mammary cancer in the way that humans develop breast cancer, allowing us to study progression of the disease. Using specialist microscopes and imaging equipment, I am able to visualize many different proteins all within the same sample. This tumor was labeled for the active form of a protein (red), which is involved in regulating the cell cytoskeleton and movement. As cancer develops, levels of this protein increase as cells start to become invasive. What are the next steps for you in your research? We have discovered that the proteins involved in cell movement (labeled red) are more active during the later stages of breast cancer, particularly in invasive disease. We believe that if we can block this protein, or other molecules that this protein interacts with, it could be a new therapeutic option to improve outcomes for patients. Going forwards, we therefore want to discover ways to block this protein as we think that it has an important role in promoting the progression of breast cancer, so understanding how to inactivate it may be key to slowing the rate of cancer growth. How was your overall experience of winning the photo competition? I was completely overwhelmed by the response to winning the ‘Research in progress’ photo competition in its inaugural year. Up against over 260 incredibly stunning images from around the world, I was thrilled and extremely grateful that mine was chosen as the winning image. The media response was substantial, with my image, name and words being featured in such outlets as The Guardian, Science Magazine, IFL Science, and the Daily Mail. Winning the competition has therefore also given me valued exposure as an early-career researcher, and it is a fantastic experience to be able to share what we do here with both scientists and non-scientists throughout the world. Any advice for people entering this year? In whatever you are doing, studying, researching – in any field – there is always beauty to be found. If you are passionate about it, share it, and tell people about the work you are doing to understand the world and make it a better place. This year’s competition closes on the 16th November 2018. Find out how to enter here. Sarah completed her PhD at the University of Adelaide in South Australia, investigating how proteins known as receptors on the surface of breast cancer cells can encourage growth of a tumor. She is currently working at the Centre for Cancer Biology in Adelaide, as a post-doctoral research fellow in the laboratory of A/Prof Michael Samuel. Still working in breast cancer, she is now investigating how tumors interact with surrounding healthy cells, and how this influences their growth and progression.